He raises a good point. Generally speaking, when I take a backup that I know I have to keep, I rename it with a .keep extension so it doesn’t get cleaned up with everything else. Well, that works great when I know that that’s a backup I have to keep. But what about Philip’s example, suppose I take a particular database offline? If I don’t specifically rename that last backup, it will be gone in a week or whatever my retention period happens to be. Or maybe I backup different databases at different intervals (DatabaseX nightly, and DatabaseY weekly) and I’d just like to retain the last 3 backups. Regardless of the reason(s) behind it, I thought it was a worthy enhancement, so I came up with some code that should work. The first thing I need to do is find the most recent n backups. For that, I use the backupset table in msdb. So, let’s say I want to list the last 3 backups for each database. 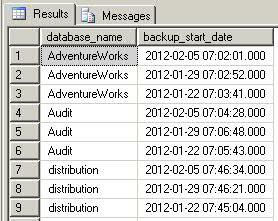 Now, all we need to do is change that query slightly to get us the min backup date. And that date is the cutoff date for deleting backup files for that particular database. So, for example, if we want to retain the most recent 3 backups, we know we can delete any AdventureWorks backups older than 2012-01-22 07:03:41.000.
we mean to delete all but the last 3 backup files for each database. This new parameter required a minor change to my initialization logic to account for the new possible value. The major change required meant adding some conditional logic. If the unit parameter isn’t ‘F’, we’ll carry on as we did before. However, if it is ‘F’, then we need to use the logic I described above to get the @deldate for each database. We also go through each individual database’s subfolder(s), rather than just a blanket delete on the BackupPath(s) including all subfolders. And there you go. I hope this helps, Philip. Give it a try and let me know how it works for you. Disclaimer: I whipped it together pretty quickly, so be sure to test it thoroughly before using it in a production environment!